A half cup of cooked spinach contains 3.2mg of iron – which seemingly makes it a powerhouse of iron. However, nutritional facts aren’t always as straight forward as they seem. The nutrient contents of foods are listed as-is. They don’t take into account the bioavailability of the nutrient – i.e. the amount of the nutrient which our bodies actually absorb and put to use. So, if a food contains 10 grams of a nutrient, it will be listed as such – even if our bodies only use a fraction of this amount. This is the case with spinach and iron. Like with many other vegetables, spinach contains a chemical called oxalic acid. Oxalic acid has gotten a very bad reputation because it binds with iron (as well as calcium, magnesium, and potassium) in the intestines, thus decreasing the absorption of these nutrients. Does this mean that spinach is a bad source of iron? According to Dr. Philip Kern, M.D. from the Department of Endocrinology/Metabolism at UAMS, the oxalic acid in spinach prevents more than 90% of iron from being absorbed. The RDA for adult males is 8mg/day and 18mg/day for menstruating females. Assuming that only 10% of the iron from spinach is absorbed, adult males would need to eat 12.5 cups of cooked spinach per day to meet RDAs and adult women would need to eat 28 cups per day! But (I reiterate), nutritional facts aren’t quite so straight-forward as this. There are other factors which can influence iron absorption. Studies show that vitamin C can increase the absorption of iron, even in the presence of oxalic acid. One study published in the British Journal of Nutrition showed that 1 gram of citric acid was able to increase iron absorption by over 300%. Thus, vegetarians who rely on spinach and other greens as a source of iron are encouraged to consume vitamin C along with the greens (which can easily be achieved by squeezing some lemon juice into your water). Iron is divided into two types: heme iron which comes from animal sources and non-heme iron which doesn’t come from animal sources. Even in foods which are low in oxalic acid, non-heme iron has a much lower bioavailability than heme iron. Studies show that heme iron has an absorption of about 15-35% compared to just 2-20% with non-heme iron. To make sure that they are getting enough iron on a plant-based diet, the Institute of Medicine recommends that vegetarians consume double the amount of iron that is recommended for the general public. Spinach may not be the great source of iron that it is often hyped-up to be. However, it is still a great source of other nutrients such as vitamin A, vitamin E, beta carotene, and antioxidants. 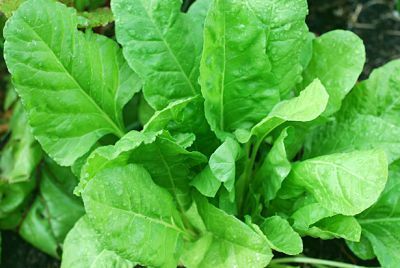 Further, young spinach has lower amounts of oxalic acid than mature spinach, so its iron content will be better absorbed. *Note that these amounts also don’t reflect the bioavailability of the iron! Thanks to the numerous vegetarian supplements which are available, there is no need for anyone to fall short of their iron RDA. However, because it is possible to overdose on iron, it is best to consult with a doctor and have a blood test to measure iron levels before taking any iron supplement.